Which is the best pinstripe sheets queen? 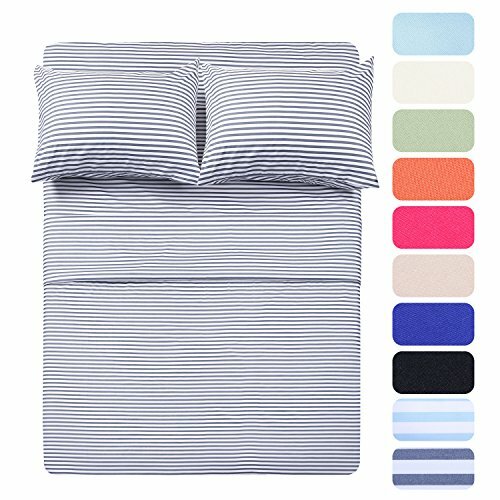 Which is the best queen sheets navy stripe? NATURAL & EXTRA SOFT- Woven from the finest Brushed Microfiber Yarns to ensure super soft luxurious sheets which are breathable and long-lasting with a specialized finishing process to enhance the softness of the fabric.Best choice for any room in your house - bedroom, guest room, kids room, RV, vacation home. Great gift idea for men and women, moms and dads, Valentine's - Mother's - Father's Day and Christmas. Queen Size Luxury Value 4 Piece Bed Sheets Set: 1 Flat sheet (90"X102"), 1 Fitted sheet (60"X80"), 2 Pillowcases (20"x 30"). HIGH QUALITY - Made of the highest quality microfiber and workmanship so you know it LASTS! Fabulous selection of colors will make your bedroom look like it belongs in a magazine.No misleading Title or Description. Unbeatable prices. Fabric Composition: 100% Microfiber, Weave: Plain Sateen. DEEP POCKETS: Deep pocket fitted sheet with elastic all around (not just the corners, like other sheets). Fits mattresses up to 16". EASY CARE: Hypoallergenic and dust mites resistant. No Smell, soft & full of elasticity, take good care of your skin. "Original soft to touch "designed to create a simple look, also keeps you cool during summers and warm during winters.Fade, stain and shrink resistant. Machine wash in warm.Don't bleach and dry clean. After washing the fabric will feel more soft and comfortable. Our company was founded in 2008,is a comprehensive professional hotel supplies production and operation enterprises,we have R&D ,design,production and sales departments.Our many years of experience and customer feedback helps us bring you the best product at an affordable price.We strive to create products using the finest textiles,We find techniques that include better stitching, stronger weaving,We thoroughly test each Homelike Collection item and rely on feedback from our customers to help us deliver the highest quality. 1,Carefully Selected & Check Fabric-Natural,recyclable,no smell,high tenacity and elasticity take good care of your skin and low-carbon lifestyle.2,Reaction Dye-Fade resistant,more durable than cotton sheets and long time use always as new.3,Unique Craftsmanship Sanding -No pilling, feel soft, comfortable, rich texture and easy care ,and reduce shrinking.4, Professional Sewing Machine-No RIPS, no holes, better stitching ,tear-resistant and strong weaving. Bring soft and cozy feel to your bed with our brushed microfiber sheet set. Our classic 4 piece sheet set is designed with your comfort in mind.Each of the fibers are brushed in order to provide softness right out of the package. Get into your bed and sleep peacefully with a soft, lightweight sheet set that looks and feels great.Tensile and soft, easy to keep shape, no fade and ironed needed, elastic, excellent flexibility and not easy to blister, which brings you wonderful soft touch of our sheet set.These sheet sets are effective for people who have allergies because they repel dust mites and also provide a cool and soft sleeping surface that is free of allergens. Your satisfaction is our top priority and we stand behind our product and customers.100% No hassle money back or replacement guarantee!